What goes hand in hand with winter? Dry, cracking skin. It can be painful, uncomfortable...and ugly. I hide my hands under my gloves. It's embarrassing. When I wear jeans, my skin itches beneath my jeans. It's annoying. When I was asked to try Vaseline's Intensive Rescue lotion, the invitation couldn't have come at a better time. This winter has wrecked havoc on my skin. I can't remember a winter that has been colder and drier. It has not been kind to my skin. I received Vaseline Intensive Rescue about a month ago. I began using it immediately. I desperately needed it. My skin was so dry. My hands looked like those of a ninety year old. It was bad. One of the most effective properties of the Vaseline Intensive Rescue is that it delivers 24 hours of therapeutic moisture. Most other lotions quit after a few hours, leaving your skin looking dry. I like knowing that hours after I've applied the lotion, it is still working. And since you can't see your skin in the winter when it's hidden all those layers, it's nice to know that's it's still working long after it's been applied. Within 3 days of beginning use of the lotion, the skin on my legs and hands was visibly smoother and more moisturized. It's non-greasy. I've found baby oil to be effective at treating dry skin, but I don't like the greasy feeling. 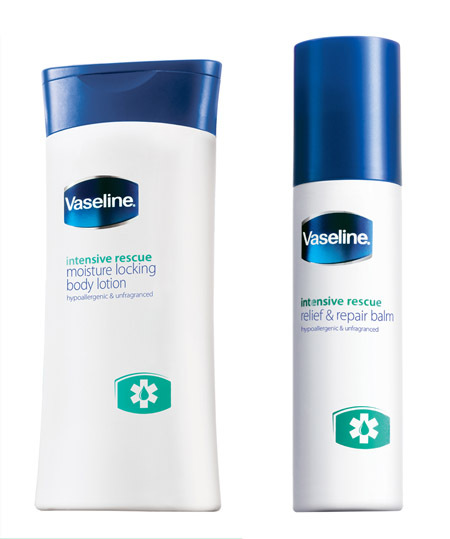 I love that Vaseline Intensive Rescue treats dry skin just as, if not more, effectively than baby oil, and there's no greasy residue. It has a light, clean scent without being over-powering. The retail cost is about $4.50 for a 10 fluid ounce bottle. The lotion is not chemical-free. Although this is not a huge downside for me, I have been moving towards using more natural personal grooming products. Vaseline has spent the winter on the road with the Dry Skin Patrol, a five-woman team who suffer from dry skin. The Dry Skin Patrol has ventured across the country to 4 destinations , such a Aspen and Duluth, where they have put their skin and Vaseline Intensive Rescue to the test. Check out the Dry Skin Patrol and enter to win an experience similar to the stops on the Mission tour at http://on.fb.me/bvsBHt. Disclosure: I received a complimentary 10 fluid ounce bottle of Vaseline Intensive Rescue Fragrance-Free Repairing Moisture lotion to facilitate this review. All opinions expressed herein are specifically mine. I received no monetary compensation to write this post or endorse this product. To view my full Disclosure Policy, click here.